There were two main contenders for the Pirelli World Challenge GT championship: Cadillac’s Johnny O’Connell and R. Ferri’s Olivier Beretta. Beretta was a highly controversial figure this year, with his rough racing style prompting a podium walk-off at Long Beach. Now he won’t get a championship, either. Beretta in the number 61 Ferrari 458 GT3 Italia and O’Connell in the number 3 Cadillac ATS-V.R were running neck-and-neck at Laguna Seca, with O’Connell out in front for a while. So, what did the now notorious Beretta do? He stuck the 458’s nose in where it didn’t belong next to O’Connell at the corkscrew, taking Johnny O’Connell off with him. Beretta was able to quickly restart his car and move into third position, but O’Connell immediately fell back to seventh place. Pirelli World Challenge has been pretty lenient on Beretta’s oopses this year to the point where many wondered if he’d even get a penalty for that incident, which came under review almost immediately afterwards. Surprise! The series actually penalized him during the race. Beretta was forced to do a drive-through of pit lane for avoidable contact. He didn’t serve his drive-through immediately after the penalty was called, but he got it on the next lap. If Beretta served the penalty soon enough, everyone thought he would have a chance to charge through to the end and finish well anyway despite his little moment of derp. Laguna Seca’s pit lane is short, so Beretta still ended up in sixth place ahead of O’Connell after the drive-through, but then, tragedy — or karma, depending on whose side you were on — struck the 458. Beretta pulled over at turn 11 with some kind of vehicular failure and retired from the race with less than five minutes left in the last race of the year. Thus, Johnny O’Connell came home in 12th place, giving him just enough to edge out Beretta in the GT championship for the year. This is O’Connell’s fourth consecutive GT championship in Pirelli World Challenge, and he did it this year in an unexpected car. Not even the ridiculously good Pratt & Miller-backed team expected the Cadillac ATS-V, which was new for this year, to perform as well as it did. “A very, very proud moment for everybody at Cadillac,” said O’Connell in a post-race interview. 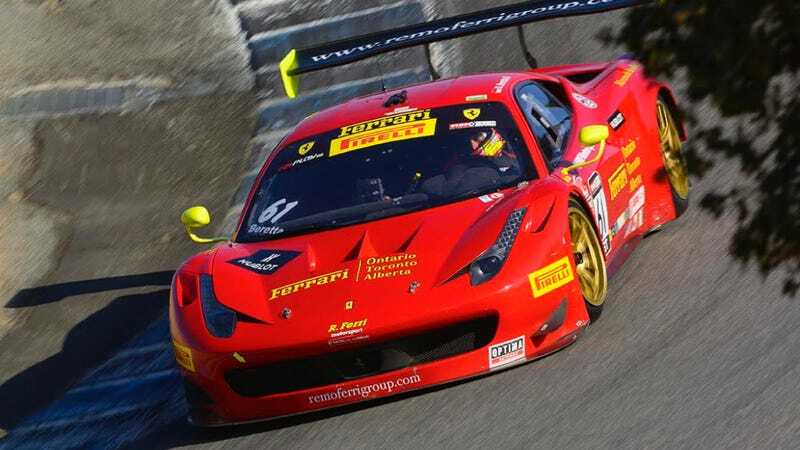 NGT Motorsport’s Alessandro Balzan won the race in GT, and DragonSpeed’s Eric Lux won the GTA class. Lux’s DragonSpeed teammate Frank Montecalvo took home the series championship in GTA as well. Colin Thompson won in GT Cup after an epic battle for the lead with Alec Udell. The orange and white GT Cup 911s were so close at times, they looked like an adorable Porsche 911 creamsicle going down the track. Udell ultimately was forced to the outside as Beretta’s faster 458 came through on lap 20, leaving enough space for Thompson to pass for the lead. Thompson also took home the GT Cup title for the year, with announcers hinting at a possible Porsche Supercup run for Thompson’s bright orange Porsche of Bucks County car. Hey, he was in the Supercup race at Circuit of the Americas last year! Go for it, dude. Update: Photographer Richard James caught the fateful dive-bomb on camera as O’Connell and Beretta both went into the corkscrew.